6" long, The top color is really mustard, not rust as the picture shows. 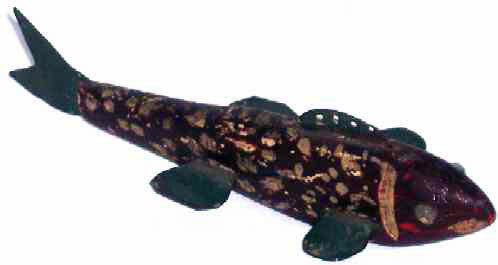 5-1/2" long with pinned glass eyes and pierced tin dorsal fin. Carved by Neil Canfield, Wisconsin, 8" long with carved gills. 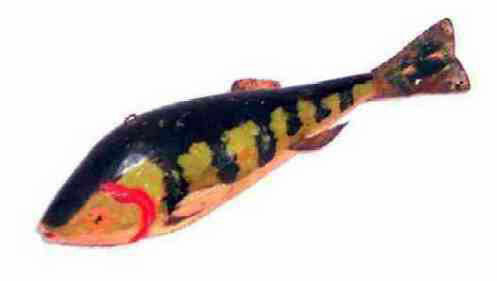 We absolutely guarantee these fish decoys to be the "real deal". While all have nicely oxidized polychrome surfaces that show some expected wear due to age and usage, the colors still remain bright and the paint for the most part, intact. The tails suggest movement through the water as they gently curve . . . this curvature, with the tail splayed outward allowed the decoy to be maneuvered in a circle by jigging from a stick, attracting the fish. All sheet metal fins are intact and original, as are the painted, tack or glasseyes. All retain the original lead weight. All are fine, honest examples of this genre of Folk Art and are guaranteed to be old. I can t help much with species as the only fish I recognize are on a menu or in the market.